A photograph showing Albin K. Longren with his first airplane on the Topeka Fair grounds in Topeka, Kansas. 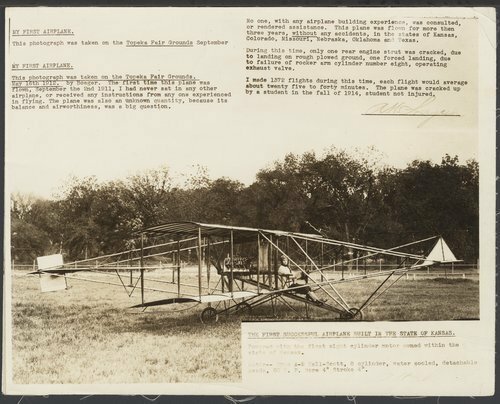 This plane was flown for the first time on September 2, 1911, and was the first sucessful airplane built in Kansas. It was powered with the first eight cylinder motor owned within the state of Kansas. The motor was a type A-2 Hall-Scott, 8 cylinder, water cooled, detachable heads, 60 horsepower, bore 4" and stroke 4". Collections - Photograph - Longren, Albin K.